10:32pm – Big Brother sends the Housemates some alcohol. 10: 19pm – Cee-C’s diary session. 10:10pm – Tobi’s diary session. 10:01pm – Khloe’s diary session. 9:34pm – Rico Swavey’s diary session. 9:17pm – Alex’s diary session. 9:11pm – Miracle’s diary session. 9:01pm – Anto’s diary session. 8:54pm – During his diary session, Lolu says “Special Thank You” to everyone that has been Voting for him to this stage of the Game. 8:43pm – Lolu’s diary session. 8:35pm – During her diary session, Nina wishes her boyfriend Collins a Happy Easter, she says that he should know that she’ll always be there for him. 8:32pm – Today’s diary sessions kick off with Nina. 7:32pm – This week’s Live Nomination show has come to and end. 9:00am – Housemates’ morning workout session has now come to an end, they’ve exited the arena and are back inside the house. 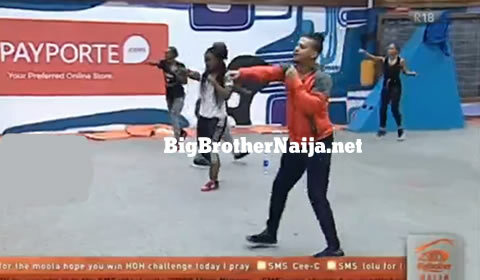 8:40am – The Housemates are in the arena taking part in their Morning workout session and the Trainer didn’t come here to Play Games, he’s giving it to them. 8:08am – The housemates’ morning workout session has now kicked off. 8:04am – Housemates move to the arena for their routine morning workout and today Big Brother has sent a trainer for them, his name is Lawrence. 7:57am – Housemates are all seated in the garden waiting to move to the arena for their morning workout session. 7:25am – Housemates have now started waking up one by one. Good morning to you all and welcome to day 64 of Big Brother Naija 2018, follow today’s Live Feed Blog for all the latest updates. You can as well check out yesterday’s highlights Here. 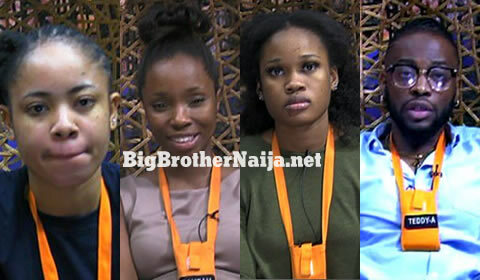 Day 57: Four Housemates Up For Possible Eviction, Who Are You Saving?